Problem: How do you aggregate large amounts of qualitative data, in a way that does not destroy the interesting details, and/or prematurely impose your own interpretations on the data ? E.g as we often do by counting and/or cross-tabulating frequencies of references to types of things or events of specific interest to ourselves as researchers/evaluators. Assumption: If we are able to develop better representations of complex bodies of information then this will provide us with more informed choices about how to respond to the content of that information. The core idea: A combination of two methods can help us aggregate and analyse qualitative information in a way that is participatory, transparent, and systematic. Linking concept: When people categorise people, objects, events, etc, they create relationships between those events. Two or more entities in the same category can be seen to be related to each other, by that joint membership. And when they categorise objects they also add information to them, in the form of category labels or descriptions (a form of what Dave Snowden calls self-indexing). Pile or card sorting is a very simple exercise, where participants are asked to sort a set of objects into groups, on the basis of their similarity (i.e. the attributes that they share), as seen by the participant. Having done so, participants are then asked to explain what the objects in each group have in common, and a label is developed for that group, on the basis of that description. The particular kind of sorting discussed here and in sections 2 is “open sorting” by multiple participants, who are given a common set of objects to sort into categories of their choice. Open sorting means participants are allowed to sort the set of objects into any number of categories, as they see fit. In section 7 a different application of the same basic idea is explained, using closed sorting. With small groups sorting could be done by individuals. With larger groups, it may be more appropriate to have sub-groups (representing different interests) do their own joint sorting exercise. PS2: How is pile sorting different from tagging? (a) Tags are usually only one or two words long, whereas descriptions given in pile sort exercises can be whole sentences or longer. The qualitative data is richer; (b) The same tag may be applied to various items at different points in time, and as a result it’s meaning may vary each time. Descriptions given during pile sorts are given to a set of objects at the same time. There is likely to be more consistency of meaning. Example: A network diagram showing similarities between 24 districts in Indonesia as separately pile sorted by 5 staff members of a project working in all those districts. Items that have been categorised in the same way by different respondents are shown with strong (thick) links. Items that were categorised differently by different respondents have weak links and are more likely to be on the periphery of the network. Example: A network diagram showing the similarities in the categories used by the 5 staff members, to classify the 24 districts. Categories with few shared items as members are shown as having weak or non-existent links. For example, those on the top left of the network diagram. These may be of greater value because they are telling us something that other categories don’t. Participants who have categorised many of the items in the same groups are shown as having strong links. PS: In the example above, there seem to be more similarities between gender than across gender of participants. There are two clusters, of men and women. The network diagrams referred to above have been produced using UCINET & NetDraw. I have set up a seperate web page on the details of the data processing steps that need to be followed to generate each of these visualisations with this widely used software package. 3. Seeing web pages as the equivalent of pile sorting exercise results. Web pages are piles of links, brought together by website designers who think the links have some form of shared relevance. Links to other websites can be seen to be conceptually linked when they are referred to on the same webpage, in the same way that items on cards can be seen to be conceptually linked when they are included in the same pile, produced by a card sorting exercise. A single Google search for two web page addresses will produce a list of sites where both are listed. See this example of a Google search for “www.dfid.goc.uk, www.worldbank.org“. The number of the sites containing both of these links tells us something about the relative strength of that conceptual link (i.e a lot of people see some form of commonality, though not necessarily the same form). I applied this idea in 2008, when wanting to know more about the relationships between websites that link to MandE NEWS. I started in a somewhat haphazard fashion. I listed the nine websites connected to www.mande.co.uk, as shown on Touchgraph at that time. Then I added four others shown by my website statistics as frequent referrers (Ideally this listing stage should be approached more systematically because it affects any reading of the results). I then Google searched for all pair combinations of these web addresses (i.e =91). Five combinations of website addresses were never found. The rest of the results were compiled in an adjacency matrix (sites x sites) where each cell listed the number of other websites citing both the row website address and the column website address. This data was then imported into Ucinet and then Netdraw, to produce the network diagram shown below (which shows the above-median strength links only). 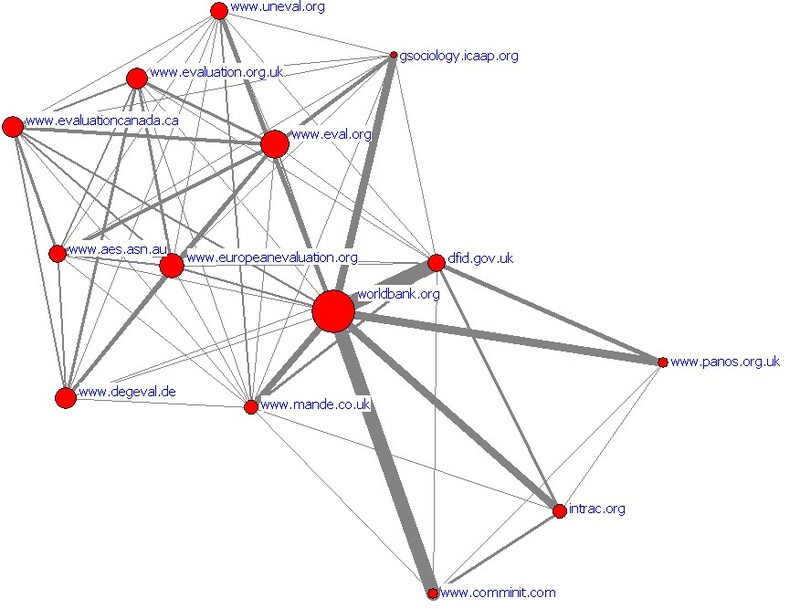 In the diagram www.mande.co.uk is connected to two groups: (a) evaluation societies to the top left and (b) development aid oriented websites to the bottom right. This exercise really needs to be re-done, with a more systematic and exhaustive approach to listing the website addresses to be searched for in pair combinations. NB: Click on the image twice to get the largest size version, which is more readable. When people tell stories, during the use of a Most Significant Change process or through other means, they can also be asked to self-classify those stories. You can see this as one of the options built into the use of SenseMaker® in Kenya, (described in Cognitive Edge’s Final Report of their work there with GlobalGiving). Respondents were given 12 categories to choose from and asked to select three which they think were most relevant to their story (See page 15 of the pdf). You can see the same approach built in to this draft online survey, I prepared to enable a Dutch NGO to collect MSC stories from their grantees’ stakeholders. In this second example, there is an extra step (Question 3), where the respondent also generates their own headline for the story. This headline is effectively their unique descriptor, for a story that fits the specific combination of categories they have chosen. This self-categorisation data can be summarised in a “two-mode” matrix in Excel, showing listed stories x listed categories that apply to them (as seen by respondents). Using Ucinet, this matrix can then be converted into two kinds of “one-mode” matrix, showing: (a) how specific stories are connected to specific stories, by being given the same set of categories, (b) how specific categories are connected to specific categories, by being applied to the same set of stories. Both these matrices can be visualised as networks, using NetDraw. The following network diagrams use data from a sub-sample of 195 of the 3000+ stories collected in Kenya by Cognitive Edge. The first diagram shows stories that are connected to each other by having three shared categories. 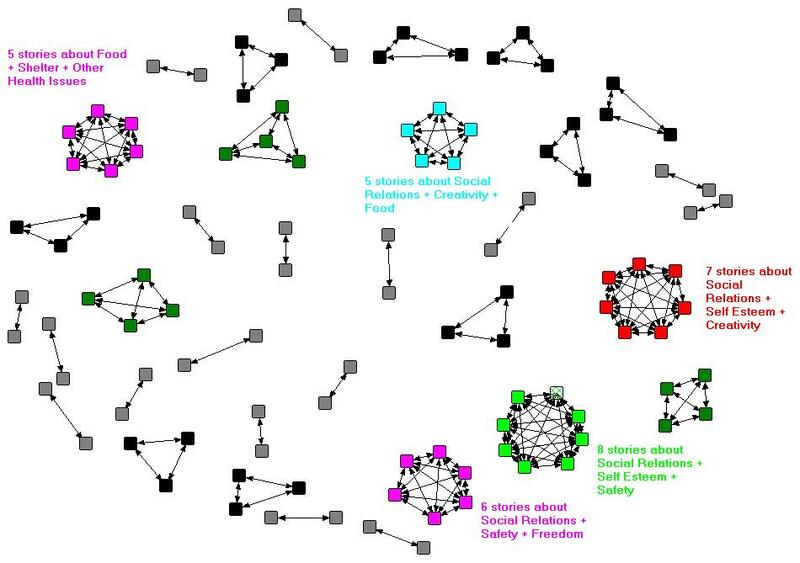 Each cluster of stories is connected by a different and specific set of shared categories (NB: If they were the same categories they would all be in one cluster). 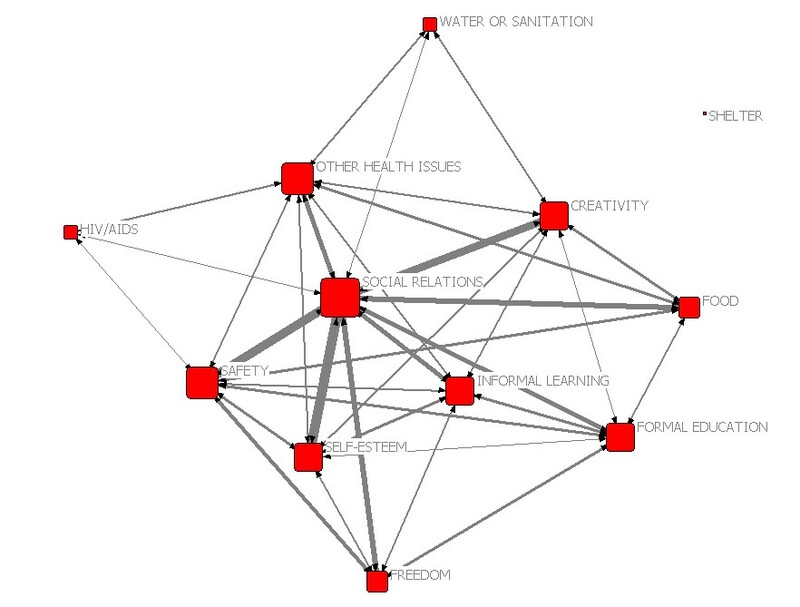 The point of this exercise is that the combination of self-categorisation plus network visualisation enables the stories to be self-organised into groups which are likely to share some commonalities of content. These groups would not be easy to find simply by a directed search for different combinations of categories because the number of possible combinations of 12 categories (in pairs, triplets, and larger groups) is very large (see more on this below). Click on the image (twice) to fully enlarge it. Using NetDraw it is possible to click on each story node in the original network diagram and identify its contents, as summarised in its title. These could also be displayed in the above network diagram, but that would produce a very crowded picture. The second network diagram below shows how the 12 categories on offer were connected, by being applied to the same sets of stories. Only the above average strength connections (i.e. above the mean number of shared stories) are shown. Categories on the opposite sides of the network e.g. HIV/AIDs and Freedom, Water or Sanitation and Freedom, usually applied to quite different sets of stories, whereas categories in the center were often applied to the same sets of stories. The attached paper ( Scale and categories: Exploring different options for self-signifying stories ) reviews the different options within the SenseMaker® software suite (as used in Kenya) for securing self-descriptions of stories provided by respondents. Two of the three kinds of options discussed in the paper can also be incorporated into easy-to-design online survey instruments available via third parties like SurveyMonkey.com. These are the use of multiple categories (discussed above) and simple bipolar scales. Social network analysis software can then be used to analyse the data that is generated. Services like SurveyMonkey.com also have a valuable additional function whereby participants can access and search the aggregated survey results, including filtering of responses according to any of questions, and types of responses to those questions. So, for example, one could search for all stories given both category X and category Y. As suggested above, such “directed” searches do have their limitations. The number of possible combinations of categories escalates dramatically as the number of available categories increases. They double each time an additional category is added. So where twelve categories are provided there are 4096 possible combinations (of singles, doubles, triples (etc up to 12) combinations of categories!! Even where respondents are told to only use up to three categories out of the twelve there are still 2573 possible combinations!! The details behind this calculation are available in this spreadsheet. Looking for clusters of stories within such a big combinatorial space is therefore like looking for the proverbial needle in the haystack. Fortunately, this where the network software is so useful. With Netdraw you can set filters to find all stories connected by 1 or 2 or 3, etc shared categories. The diagram above shows all stories connected by three categories of stories. There is another positive side to this unexpectedly large number of combinations of categories. Though we might be providing only a dozen pre-defined categories, respondents can by careful choice of combinations of categories produce quite specific descriptions of their stories. What initially looks like a Procrustean bed ends up looking more like a five-star hotel. PS1: On the implications for the use of the Most Significant Change technique: MSC involves a social process wherein there is a reflection on a variety of changes that have taken place, the selection of the most significant of these, and the retention of that choice for wider use. When a number of those retained choices are pooled, variety is re-created, and a new selection can be made amongst these, in order to find and retain changes which have wider significance still. The selection process requires people to read and discuss a small set of stories, usually no more than ten because it is difficult to understand and compare a large number of different stories. In this context, it matters how those groups of stories are put together prior to discussion and selection. In the original use of MSC in Bangladesh, stories were placed in one category or another, which were based on the NGO’s four main concerns (changes in quality of people’s lives, changes in sustainability, changes in people’s participation, and any other changes). These were mutually exclusive categories. Since then there have been many other approaches to grouping stories prior to selection. The network of self-categorised stories discussion above suggests two different approaches. The first is only slightly different approach and involves allowing respondents to classify their own stories using a number of non-exclusive categories. With this approach, a particular MSC story might belong to multiple categories and could even be selected as the most significant within each of those categories. That would not necessarily be a problem, in fact the story concerned might thus be identified as especially meaningful because of its multiple significances. The second is significantly different, which is to find and use emergent/self-organised groupings of stories, through the network visualisation described above. I suspect this has been done before on a modest scale in participatory workshops, where groups of participants were asked to read through and sort stories into groups they think have something in common. What is significantly different here is the scale on which it can be done, with hundreds of stories, something that impossible in via face-to-face participatory methods. PS2: On the implications for grantee’s progress reporting to grant giving funds: Almost all grantees of funds from development agencies or foundations are required to provide some form of periodic progress reporting, using a standardised format. A radical alternative would be ditch almost all that reporting, except the most essential, and allow/encourage grantees to report any kinds of “significant changes” whenever they wanted to, and to classify those changes using a set of non-exclusive categories (as discussed above). If done via an online survey mechanism the same grantees could be given the right to search all inputted data from all grantees. A more sophisticated option, probably via a designed website, would be to allow the same grantees to provide comment, and provide a value rating, on any contents they do find (with their identity disclosed, to stop collusion). The same facility could also be given to their grant-making body. “I See How You Think: Using Influence Diagrams to Support Dialogue” (2009) Newell B, Proust K. ANU Centre for Dialogue. The authors describe how they faciliate individuals to develop their own casual networks, then through discussion, create a new shared causal network. As they note, skilled facilitation is very important in this type of highly participatory process. Visualizing Proximity Data (2007) Rich DeJordy, Stephen P. Borgatti, Chris Roussin, Daniel S. Halgin, on the merits of network models versus multi-dimensional scaling (MDS) for analysing the results of pile sorts (described in the title as proximity data). They identified the potential well before I did. I have been more focused on its application. PS: 6th July 2010. In Social Network Analysis the term Cognitive Social Structures refers to social networks , as perceived by the members of those networks (or others). What has been described above is different and could be referred to by the term Social Cognitive Structures: i.e. the social structures created by overlaps in people’s cognitive structures (i.e. their classifications and causal relationships). Explorer – Distribute and Cluster views: “This video shows the SenseMaker® Explorer Distribute and Cluster views for exploring narrative data collected with a SenseMaker® Collector website. This particular screen-cast shows how Distribute and Cluster views can be used to explore for patterns in signification data. There has been some very interesting work done by Hidalgo and Hausemann on “product spaces”, described by Tim Harford in the New York Times (The Art of Economic Complexity: A new way to visualize a country’s development) and by others elsewhere. Hidalgo and Hausmann have mapped the world’s “product space” using trade data on 774 product classifications, from cotton undergarments to phenols. Countries are in effect the same as piles seen in pile sorting exercises and products are what have been sorted. Different countries have different combinations of products in their “pile”. Products are closely connected on the underlying network if they tend to be exported by the same economies. Finding products which are near to each other in product space means there is a good chance that a country producing one might be able to produce the other. At the fringes of the product space are development dead ends. Better-connected nodes represent industries that offer promising prospects for growth. The first network diagram in the NYT is unfortunately wrong when it says “The underlying grey template represents the “product space” It is the structure of the links that represents the product space, products that are many links (i.e. degrees) in the chain away from each other are more distant in the product space. Thanks for this – I’m intrigued by this, but I’m missing the last link… which is how insight is derived, and what kinds of insights are derived. This is something common to all network visualisation techniques I find… OK so there’s a map, so what? 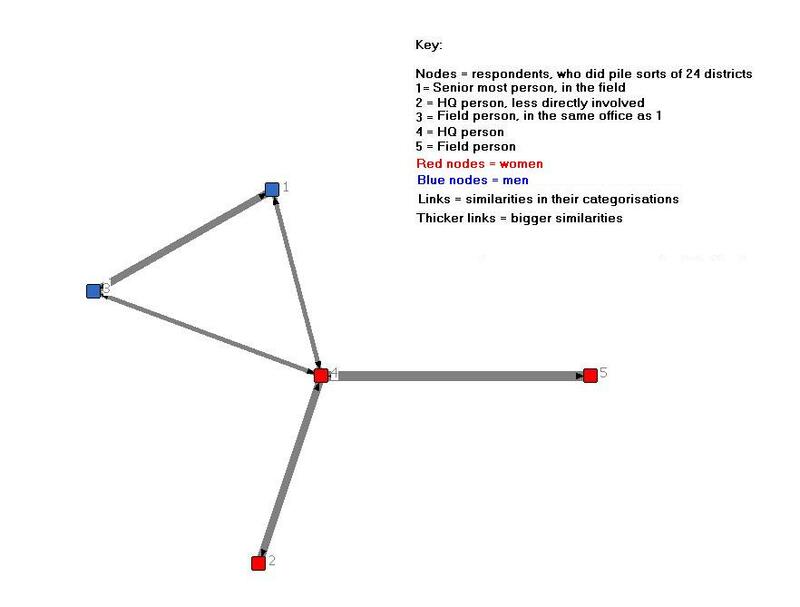 In social network analysis, for example, the map typically helps analysts/participants identify places in the network that look like they warrant further investigation – eg bottlenecks, disconnects, cliques. These can be either positive or negative forces, depending on the drivers behind that structure, and the overall context. There are different ways of undertaking that investigation to find the “story” behind the structure. I’m curious about where the sensemaking portion lies in the PAQI model – do you have examples of insights and how they are derived and then actioned? I understand this is a work in progress! I dont think I can promise anyone automatic “insight” as a result of usig the PAQI or any other method. And I doubt if David would do so either re his use of Sensemaker. With many forms of measurement and description it is useful to ask people what they expect to be found and then show them what is actually found, and to then discuss and learn from the difference. An NGO in India that I have been working with carried out a large baseline survey of capacities of CBOs in a HIV/AIDS program, that generated a set of performance scores. In response to my suggestion they asked the grantees supporting the CBOs what their expectations were about the CBOs’ scores, then they shared the actual scores, then discussed then differences. In a number of instances this led to agreement on how the survey instrument needed to be changed. I hope in other cases it led to agreement on how the CBOs needed to change! On the PAQI web page I started with this assumption: If we are able to develop better representations of complex bodies of information then this will provide us with more informed choices about how to respond to the content of that information. If we look at the one example I presented, which was the result of a very quick inquiry of 5 staff members at the end of a workshop: their classification of 24 Indonesian districts where their project was working. If I had a chance to continue talking to them today I would start by asking them how many clusters do they think might emerge from this analysis, and what would they be.After sharing the aggregated results and discussing any differences between expected and actual results, there could be two ways forward. Ask what are the implications for (a) project design and activities, (b) improved use of this PAQI method). On the former, I would love to know whether given the existence of at least two main clusters of districts (two more can also be identified less distinctly) whether there is any difference in the project strategies being pursued in those areas. And if there is none, should there be a difference? On the significance of measurement on its own, I often use an imagined situation where two people walk into a room each holding a tape measure. They both proceed to measure the dimensions of a large hole in the wall. One walks away happy, the other walks away unhappy. The first is an air conditioning installer, the other is a security expert. So what use is a tape measure (/network diagram)? Its just numbers on arbitrary scale (/a set of dots connected by lines). Well it turns out it is important if we have prior expectations about what we want to see, but probably meaningless if we dont. Theory and measurement are both needed. PS: There are other ways of eliciting expectations prior to sharing results, with network diagrams. 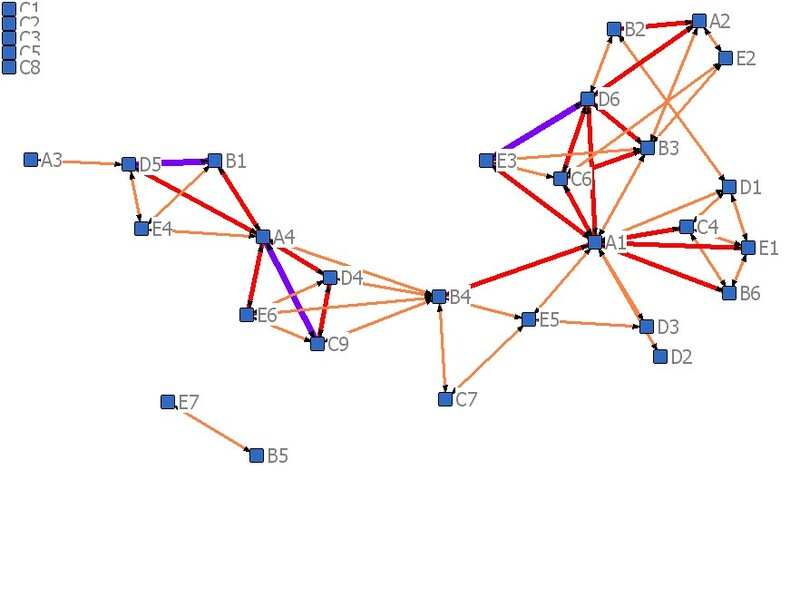 One easy method is to show network diagrams without visible labels on the nodes and ask participants to identify who is where. Then to make the labels visible. * Brandes, U., Kenis, P.N., Raab, J., Schneider, V., & Wagner, D. (1999). Explorations into the Visualization of Policy Networks. Journal of Theoretical Politics, 11(1), 75-106. * Brandes, U., Kenis, P.N., & Raab, J. (2006). Explanation through network visualization. Methodology: European Journal of Research Methods for the Behavioral and Social Sciences, 2(1), 16-23. I recently had the occasion to use Rick’s PAQI technique in an assignment for DG Translation of the European Commission about the “contribution of translation to the multilingual society in the EU” (see the final report “here”:http://ec.europa.eu/dgs/translation/publications/studies/multilingual_society_study_fr.pdf. It’s in French but an English summary is available). At first we had not planned to do so: we expected to perform an extended literature review to answer the very vague yet simple question “What are the effects of translation?”. But after days identifying and reading books and articles, and doing interviews, we started to understand that there was no simple answer to that question, and we found out that we simply did not have a way to make sense of so much fragmented and conflicting information with the planned tools. So we decided to answer differently. It had to be cheap, it had to be methodologically sound, and it had to be quick enough to keep more or less on schedule, and of course it had to be able to answer in a detailed way to the question asked. My first idea was to rely on concept mapping as developed by William Trochim (see “here”:http://www.socialresearchmethods.net/mapping/mapping.htm), but the statistical method used to show the clusters of answers (multidimensional scaling) is out of my reach, when network analysis as used in Rick’s PAQI is a lot easier to me. * First, based on the work done, we listed 50 assumptions detailing effects of translation (e.g. “translation gives access to ancient cultures”). * Then we asked the experts to sort and rank the items. We used websort.net (free for 10 participants or less) for the sorting and a googledocs questionaire for the ranking. * After that we analysed the results using the free network analysis software “Cytoscape”:http://www.socialresearchmethods.net/mapping/mapping.htm, which I have been using since two years for that kind of purpose. * We obtained a weighed cluster map and various statistical information which was then discussed twice: with the members of the expert panel during a phone meeting in which they were asked to discuss what they learnt (they also sent a 500-word note afterwards) and with the Steering Committee. The method proved tremendously useful. The clusters turned into sections of the report, and the relations between items within those clusters often provided a “story” on how translation was having effects on society. The mix of statistics and expertise in the method was also highly credible for the Steering Committee and also for the experts of the field, and for a reduced cost. It is also a scalable method: we used it with 10 experts, but it is definitely possible to make the same with 100 or more participants. Now an advice on the conditions for success: it is crucial to spend as much time as possible on the first phase (definition of the assumptions that will be ranked and sorted). Had we had enough time, I would have organised at least another round dedicated to improving the wording and make sure that there are no ambiguity left. This is all the more important that the assumptions we had were simple sentences, to make sorting and ranking easier, but complex causal relations can only difficultly be reduced to simple assumptions. I would largely echo Patrick’s comments above; this is fun to think about, but the value is in operationalizing the concepts. We’ve developed a tool for PAQI that focuses less on developing visualizations of data, and more on interaction with the data. The tool is an iPhone app called EthnoCorder (http://www.ethnocorder.com). It basically lets you code statements of actors WHILE recording those statements using digital video. So you get essentially the same type of data you would from sensemaker (i.e. it could be plugged into the analytical/visualization software discussed above, as it gets exported in standard SQL format), but you also have the video to drill down into as primary data later (sensemaker basically uses secondary data, the actual statement of the actor is lost). EthnoCorder pulls Participatory Video work into this conversation. Our surveys don’t simply collect data and stories, and allow for real-time indexing, but through iterations of the process, we also use EC as a platform for screening stories, collecting further reactions, and coding those statements (the iterations of the MSC process). Its all closely related conceptually, but with more emphasis on interacting with the data in a participatory way. This makes a big difference when we start recognizing Patrick’s point that all the analytics really need to result in a sense-making process that people can meaningfully engage with. I can see spending time mastering these data visualization suites, tinkering with them, and being amazed by the complex images they can produce, but still only having secondary information. With EthnoCorder I can deal with the data using easily accessible spreadsheet software like Excel, and directly relate that back to the primary qualitative data (we embed demonstrative video clips in our reports to allow the reader to interact with the primary qualitative data that the quantitative analysis draws on). You get a thorough, rich understanding of the data without getting tangled in a web of artificial network graphs. This lets you spend more time engaging the actual problem. Even using basic descriptive statistics we already get blow-back from donors complaining that our reports read more like ‘research’ than ‘development’. I think this goes to show how starved the industry still is for really solid analysis of qualitative data that forces us to confront the complexity of the contexts we work in. I find the most helpful advice from Snowden’s (2007) writings to be that leaders responding to complex problems need to “increase levels of interaction and communication”. I’m not convinced that a focus on data visualization really does that. EthnoCorder is much better suited for this task, and I’m looking forward to seeing all these tools and ideas converge. I’m always interested in looking at the data in different ways, and I bristle when people assert dismissively that I’m using ‘fancy tools’, so I am not saying that these data visualization packages are worthless. However, I think we have to be careful of being mystified by technology and math, lest we lose touch with the reality of issues at hand. I have written a detailed response to your post, in this attached Word doc.